The use of grazing muzzles reduced the forage intake of horses in a study by an average of 30 percent during four-hour grazing spells. Researchers from the University of Minnesota found that the effectiveness of grazing muzzles was not affected by different forage species used in the study. They set about to assess not only the ability of muzzles to reduce forage intake, but also whether the form and structure of different grass species affected their consumption through muzzles, and whether the muzzles ultimately had any effect on horses’ preferences for different species. Researchers Emily Glunk, Craig Sheaffer, Marcia Hathaway and Krishona Martinson conducted the research in 2012 and 2013. Four horses were grazed in 2012 and three in 2013. Four species of perennial cool-season grasses were grazed in 2012 including Kentucky bluegrass (Poa pratensis L.), meadow fescue (Schedonorus pratensis Huds. ), perennial ryegrass (Lolium perenne L.), and reed canarygrass (Phalaris arundinacea L.). In 2013, only Kentucky bluegrass and reed canarygrass were grazed because of winter kill of other species. Horses were allowed to graze a small pasture seeded with an individual species for four hours each day in June and August of 2012 and August and September of 2013. Horses grazed the same grass species for two consecutive days – one day with a muzzle and one day without. Before and after each grazing, a strip was mechanically harvested to determine initial and residual herbage mass. The difference was used to estimate forage intake. The researchers, reporting their findings in the Journal of Equine Veterinary Science, found that the effectiveness of a grazing muzzle was not affected by forage species. 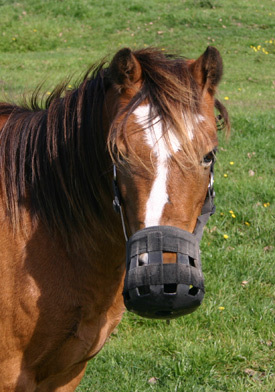 The use of a grazing muzzle was found to decrease the amount of grass eaten by an average of 30 percent in the study compared with not using a grazing muzzle. Emily C. Glunk, Craig C. Sheaffer, Marcia R. Hathaway, Krishona L. Martinson. Interaction of Grazing Muzzle Use and Grass Species on Forage Intake of Horses.